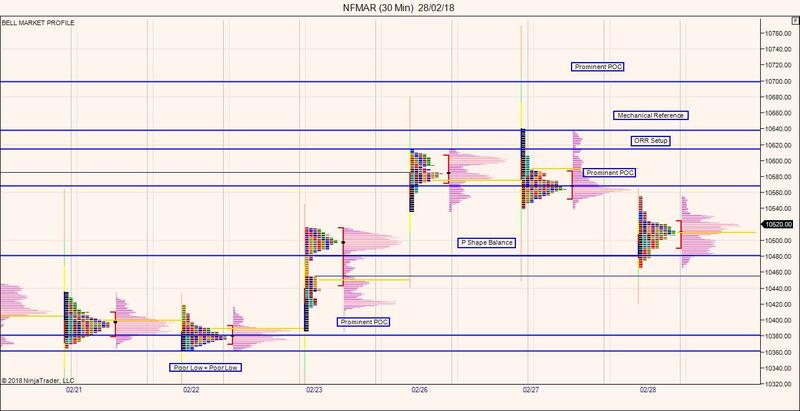 Nifty Futures opened gap down on Wednesdays trading session post gap down more of day timeframe sellers started actively dominated the market and resulting in a open auction outside the range.Though price is in balancing mode, value started building lower. At the same time, day timeframe stops too hunted in the second half of the trading session resulting in closing the Wednesday daily gap thereby removing the weaker hand intraday sellers. Trading Sentiment continued to be negative 10480 (P Shape Balance) is likely to act as support zone any acceptance below that could bring 10381 and 10343. However price holding 10480 could bring a possible test towards prominent POC 10570 the weaker ORR reference 10618.